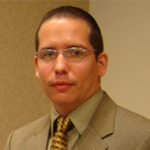 Enrique Gonzalez-Velez is a doctoral candidate at University of South Florida (USF). His area of concentration is transportation engineering and his expected date of graduation is Spring 2010. Mr. Velez is a member of the National Scholars Honor Society. He is currently a research assistant with the Center for Urban Transportation Research (CUTR) and has previously served as a teaching assistant at the University of Puerto Rico. Patricio Alvarez is a doctoral candidate at Florida International University (FIU). His area of concentration is transportation engineering and his expected date of graduation is December 2010. Mr. Alvarez is very active in professional organizations, including the American Society of Civil Engineers (ASCE), Chi Epsilon the National Civil Engineering Honor Society and he serves as the Vice President of the FIU ITE student chapter. He earned the Outstanding Masters Graduate Award from the College of Engineering and Computing at FIU in 2008.